Combine softened butter, cilantro, jalapeno, lime, ginger, and salt in a small bowl and stir until well combined. Keep at room temperature if using right away or store in the refrigerator if using at a later time. Preheat grill and spray with cooking spray. Salt and pepper each halibut fillet. Grill 3-4 minutes per side or until fish is opaque. Remove fish from grill and squeeze with the lime that was reserved after zesting. Right before serving top each fillet with a heaping teaspoon of herbed butter. Enjoy! My grill is getting some major mileage these days since it is such an easy and fast way to get dinner on the table. This Grilled Halibut with Herbed Lime Butter was a flavor party in my mouth. The fish is a perfect light summer meal kicked up a notch with a spicy herb infused butter that will make your taste buds sing. My mother-in-law gave me the recipe for the spicy herbed butter and I’m so glad I gave it a try. Really, I could eat it by the spoonful if that was acceptable! It has a gentle kick and is made with lime, garlic, jalapeno, ginger, and cilantro. Just place a heaping teaspoon on the warm halibut and let it melt and ooze all over the fish. 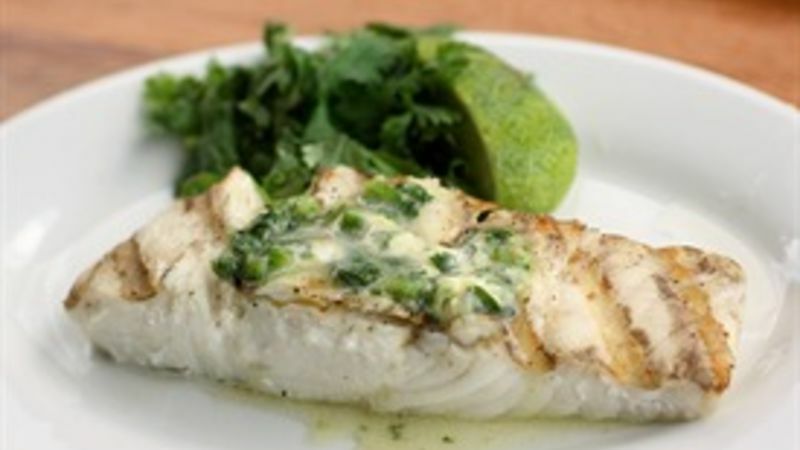 The herbed lime butter is a perfect compliment to the mild flavor of the halibut and is also excellent on other firm white fish like tilapia or mahi. But it doesn’t stop there; this butter is great on lobster, chicken, or beef. I may even try it on toasted garlic bread. Eating healthy does not have to be boring. You will be happy to add this to your good-for-you repertoire. Like to grill fish? Check out our collection of easy Grilled Fish Recipes!